What’s it like to receive a Fix? From “It feels just like Christmas” to “I love this”—there are so many ways to feel when you open your Fix and find 5 items that were handpicked (just for you!) by a Stylist. Don’t take it from us—just ask these ladies who perfectly summed up how it feels to get a Fix! Want to unbox your own Fix? Learn more about how our service works and schedule one to find out! Feeling inspired to make your own unboxing video? Keep reading to get the step-by-step instructions and helpful tips to make your own video to share with your friends, followers and your Stylist! Grab a camera, a tripod (or a friend) and your Fix! Show off your new pieces to the camera. Try everything on (but don’t change on camera, of course!) Show us what you loved and how everything fits. Edit your video! Use a video editing software (you can find a free one too!) and cut out any long pauses or word fumbles. Upload your video to YouTube or another video streaming service. Don’t forget to share it on your social media channels—you can even share the link with your Stylist in your Fix Note. Make sure you have bright lighting! Make sure your filming location is nice and bright. Natural, diffused light works best (think a sheer curtain over a window) or lamps with shades. Shorter videos are best. Aim for a video between 2 to 3 minutes long—that’s best for everyone’s attention span! Quiet on the set! Close windows, doors and turn your phone on silent before you hit record. Your camera can pick up outside noise and distract viewers during your video. Film horizontally. Vertical videos show up small on computer screens, so make sure you flip your camera and film in landscape mode. 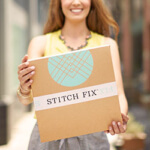 Check out our Stitch Fix fan’s YouTube channels to see more! Want in on that “unboxing feeling? Be sure to schedule a Fix!